Siri and Pentti Toimi run a small homestead in northern Finland. Pentti rules the family with an iron fist – a ferocious temper that can strike down on anyone at any time. Of their 12 living children, only Annie, Lauri, Tarmo and Voitto have moved away (physically and mentally), as far away as Stockholm, Helsinki and Cyprus (although no one knows for sure in Voitto’s case). The others remain in the Torne Valley: Esko, the conscientious oldest brother, who hopes to inherit the farm; Helmi, the sister in constant need of money (and lots thereof); Tatu, who almost perished when the garage took fire, and who is always ready to offer people a ride; Lahja, smarter than she lets on, but constantly in the shadow of her gifted brother Tarmo. And all the rest of them. It’s almost Christmas, and most of the children have gathered for the preparations the days ahead. Something is going to happen – something must happen, that is something the eldest children all agree on. The dark secret that is the last straw. For the sake of their mother, the younger siblings, and the two that came first and died: Pentti’s tyranny must come to an end. It is time to settle old scores. Soon nothing will be the same. Testament is a wondrous family drama: vibrant, boisterous and darkly amusing, carrying traits from Jonathan Safran Foer and Mikael Niemi. A polyphonic magnum opus, by a storyteller unlike anyone else. The character gallery is swarming and could potentially become confusing, but Wähä juggles her characters virtuously and connects the reader with every member of the afflicted, weary and hysterically funny Toimi family. I’m completely absorbed right from the start, because Wähä certainly knows how to write. There is a mild irony and subdued fierceness to her tone that makes you want to linger with the narrator’s voice /… / The novel is brimming with wistful life wisdom and dour insight. Despite the infernal darkness, the stench of diesel, Finnish quarrels and severe communication issues it still makes me want to move to the Torne Valley immediately. What a wonderful family chronicle. 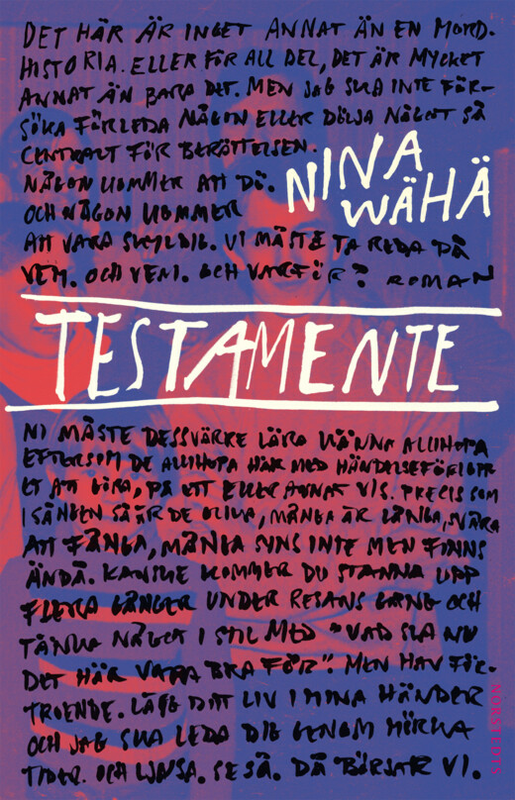 I’m completely dazzled after having read Nina Wähä’s Testament. I’m amazed that a book like this is written in Sweden today. It is rare /… / The novel is brimming with suspense, as well as powerful emotions /… / Testament adds solace to the mysterious bonds between parents and children by portraying the chaotic Toimi family where terror and tragedy live next door to bread baking and laughter. Is the image of the Torne Valley truthful? Perhaps the author knows her setting or perhaps she has conducted rigorous research. But I don’t think the question is important. Because she masters the art of storytelling, and that is what makes Testament a simply fantastic reading experience. I’m writing this review in anger, caused by the outrage that arises from having something stolen from you, something that is rightfully yours. Let me start from the beginning; I have just finished reading Testament. You must understand. It is normal to feel a little grumpy when a good book has come to an end. But this? I have lived with these characters, no, these people for days on end. And suddenly it’s over. I’m not disappointed, I’m devastated! /… / The way she allows each family member to momentarily be the lead character, and the way each one does it so convincingly that you forget about the rest, forget previous favourites and become temporarily obsessed with this one child, at the same time as the individual story adds depth to the rest and the family as a unit, is simply wonderful. Not wonderful because it is so skilfully done, but because it reminds you that everyone carries a small universe within, something great and profound that you can never fully understand. The prose has a completely accurate tone, with long sentences where the commas are as frequent as midges in the Torne Valley, and Nina Wähä masterly commands the rhythm in the flow that she releases. One of the author’s major challenges is to bring their fictional worlds to life. Everything may be skilfully deployed, portrayed in great detail and with a balanced dramaturgy, but still appear lifeless when the magic wand hits the text. Nina Wähä, on the other hand, has managed to write an astoundingly vivid novel /… / If her name isn’t mentioned towards the end of the year, when the major literary prizes are awarded, I would be most surprised. Nina Wähä was born in Stockholm in 1979. She made her debut in 2007 with novel S for Sister, and her second novel, Don't Look Back, was published three years later. 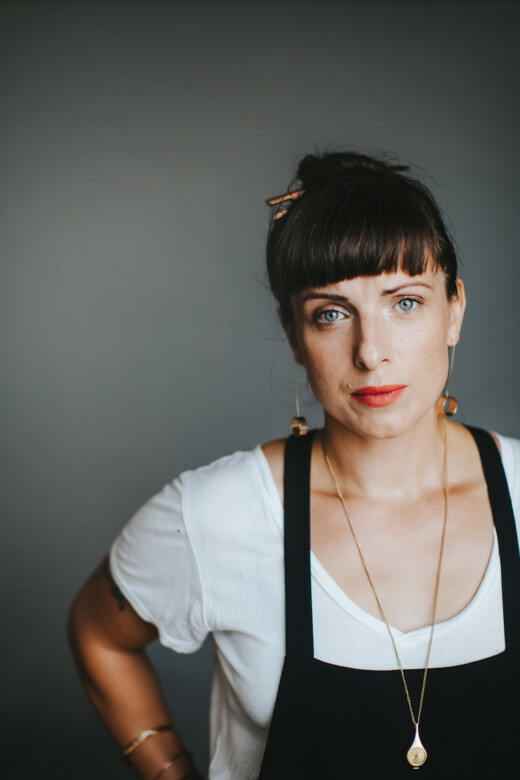 She has also worked as an actress and was the lead singer of indie band Lacrosse.